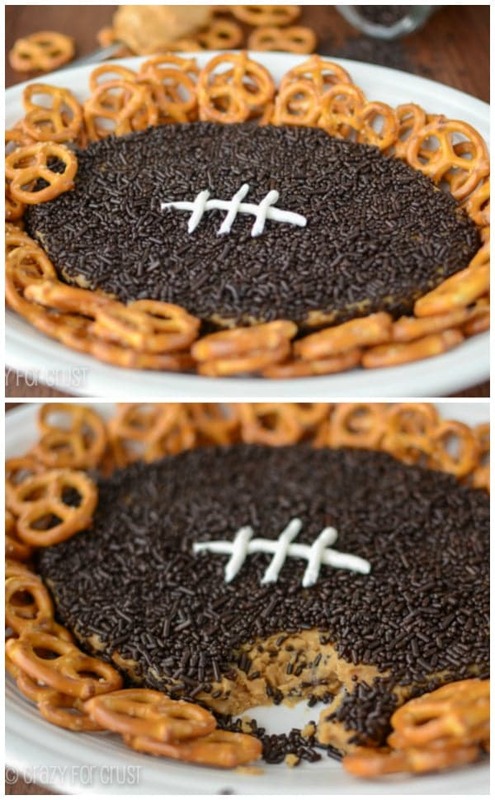 The original Peanut Butter Football Dip – a football shaped sweet dip filled with peanut butter and chocolate! Peanut Butter Football Dip is the ultimate super bowl recipe! Peanut butter, cream cheese, butter, and sugar mix to make a sweet cheeseball recipe that’s perfect for a party! Shape it like a football for game day! I don’t even know who is playing. I think the Giants are. Once the Niners lost, I kinda stopped paying attention. We’ve talked about how much my husband loves football. I was even nice enough that, during that ill-fated playoff game the Sunday before last, I took Jordan to Hell Chuck E. Cheese to play. So he could watch it alone. In silence. Without Jordan pretending to be a character in Mystery Science Theatre. Before Jordan was in elementary school I would take her away for the weekend of the Superbowl. We’d come home Monday morning and I’d fast-forward through the DVR’d game to watch the commercials. Now that she starts school at 7:50am on Mondays, traveling is a little problematic. For she and I, anyway. My husband solved that problem. He conveniently scheduled a business trip in the Bay Area for bright and early Monday morning. So he has to go stay at a hotel on Sunday night. Rendering him alone to watch the Superbowl in peace. So, Jordan and I will be home Sunday. If we don’t go to a party, we’ll tape the game and watch the commercials. Thanks to Janet and Justin, I think it’s safe for her. Mostly. Thank goodness for mute, pause, and fast-forward. Oh, and we’re gonna break this baby out and eat it for dinner. 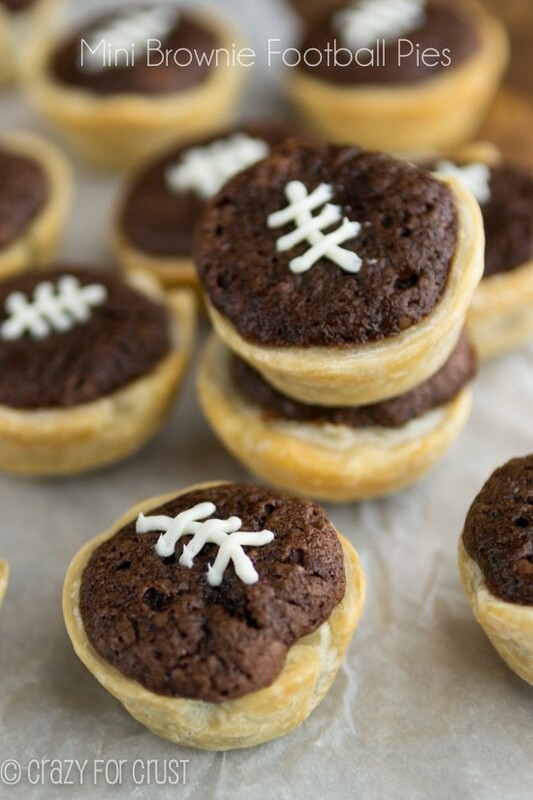 This football is the perfect game day appetizer or dessert recipe. Hey, why can’t it be an appetizer? It’s a cheeseball recipe, after all. It’s a peanut butter dip made with cream cheese and perfect for dipping with pretzels. You could even make this into a Reese’s peanut butter dip super easily by swapping out the mini chocolate chips for chopped Reese’s Peanut Butter Cups. It’s super easy to make: make your batter and form it into a football, then cover it in chocolate sprinkles (or cocoa powder…or mini chocolate chips, whatever). Cover it in something that makes it look like a football. Or, if you don’t like football and don’t plan to watch the game, you could make this for Valentine’s Day. Then eat it, with pretzels…or cookies…or a spoon, which is my preferred method. 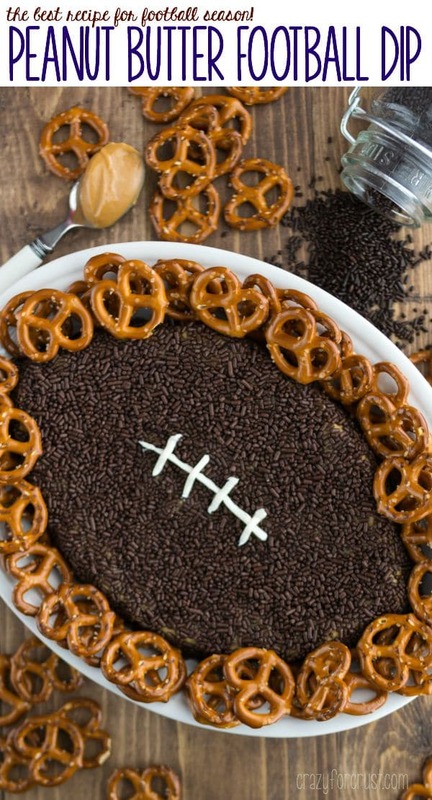 A Peanut Butter Football Dip is the perfect game day recipe. It’s a sweet cheeseball recipe full of peanut butter and chocolate! Make sure your cream cheese and butter are room temperature to avoid lumps. It’s best if you use a regular store peanut butter (NOT a natural one that requires stirring). Make this into a Reese’s Peanut Butter Dip by substituting chopped peanut butter cups for the mini chips. Pretzels are great dippers (salty/sweet) but so are apple slices or graham crackers or other cookies! 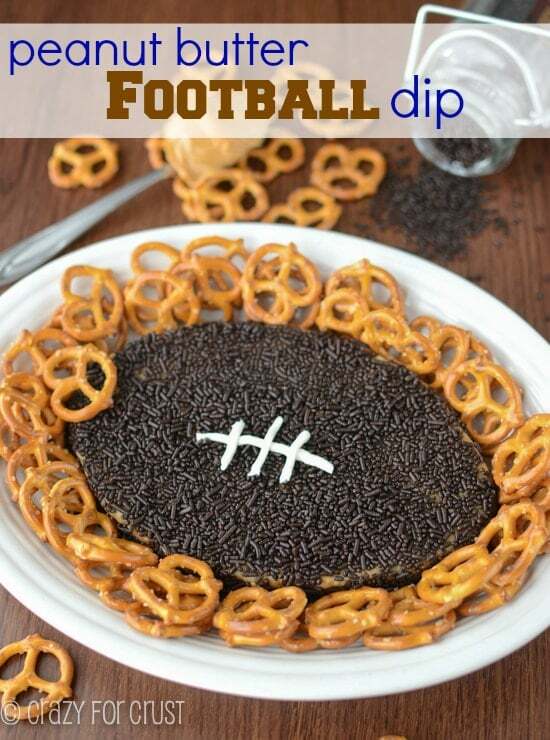 Peanut Butter Football Dip is the ultimate super bowl recipe! Peanut butter, cream cheese, butter, and sugar mix to make a sweet cheeseball recipe that's perfect for a party! Shape it like a football for game day! Cream butter, cream cheese, and peanut butter until mixed (using a hand-held mixer). Mix in vanilla. Add powdered sugar, ½ cup at a time, and mix until combined. (If you want a stiffer mixture, add the extra ½ cup of powdered sugar.) Mix in chocolate chips. Place the waxed paper onto your serving plate. (It helps if the plate has sides…less mess!) Cover in sprinkles or chocolate chips, pressing them into the surface a little so they stick. Pipe on the laces using melted white chocolate or some leftover frosting and chill until ready to serve. 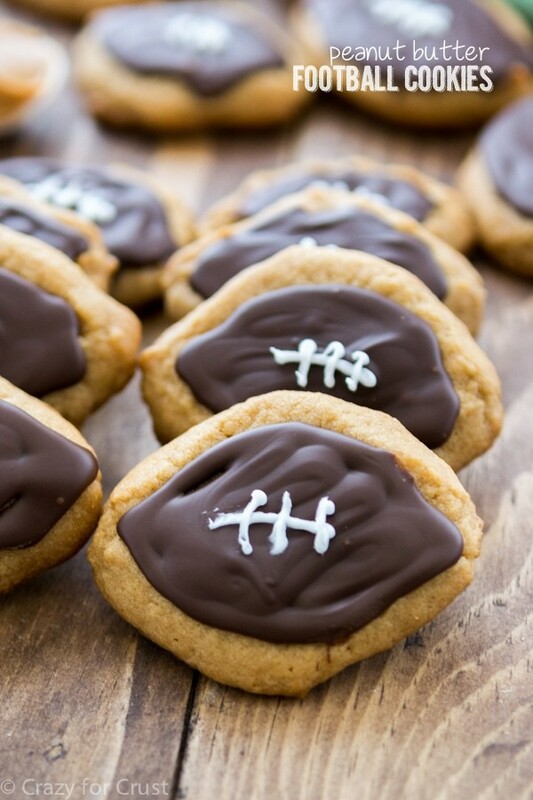 Click here to see my ultimate Football Party Menu, and here to see more PEANUT BUTTER recipes! I love this recipe. It’s delicious and you can make it into anything. I’ve done a cactus for a fiesta party (called it “Fat Cactus” and I used green sprinkles with a little bit of chocolate ones to be the needles), a bat for Halloween, obviously a football for the Superbowl. It could easily be a pumpkin shape or Christmas tree too. I was looking for the perfect football dip with peanut butter and it appears I have found it. I will be making it for my crew and this weekends game. My wife made your this for me and the kids. Needless to say we were fighting over who got the last few bites.